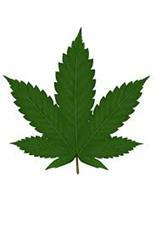 Medical cannabis dispensaries in Canada face a substantial hurdle doing business because the big banks have declined to provide services. An excellent article in the Globe and Mail surveys the challenges, especially in light of the pending major changes to our federal laws. CCEC is highlighted in the article as an agent of change, because it has agreed to provide banking services. As noted in the Globe article, provincial governments, health authorities and even the Supreme Court of Canada have affirmed that access is essentially a health issue. CCEC has agreed. CCEC wants to build healthy and just communities, by empowering ordinary people. Political and social change is underway and there are roles for community groups and community-based financial institutions to play. CCEC may be small, but we can have impact. What better way to connect with neighbourhours than supporting start-up enterprises? 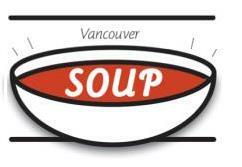 Vancouver SOUP differs from online crowdfunding in that it is in person. People come together, share an evening of food and fun, while supporting projects happening in their community. The audience, who are the ‘investors’, hear four project pitches and the ‘winner’ leaves with the door proceeds. This is building community and CCEC is proud to partner with Groundswell as a sponsor on their new project. Vancouver SOUP is based on the successful Detroit SOUP. The organizers see this project as a unique opportunity for Vancouverites to connect with each other in an easy, fun, delicious way. Vancouver is known as an unfriendly city where people feel disconnected from their neighbours and their community. The Vancouver SOUP Team feel that the problem that part of the problem can be solved by getting together with people over meaningful conversation or projects like weeding a shared garden, serving on a committee, or even deciding which community-building project to support. Vancouver SOUP can be that project. Kerrie says, “I have lived in many apartment buildings where people barely make eye contact crossing paths in the hallway. Conversations are mere pleasantries.” By attending a Vancouver SOUP event, people are launched into meaningful conversation about projects that could affect their lives. They are all in it together . The winner at the first event was Magpie’s Nest Community Art Space with their Community Art Nights where they offer free space and materials for the public to come together over art. The audience of ‘investors’ also heard pitches about launching a Zero Waste Club, starting community dialog events centered around the ‘Talking Chairs’, and harm reduction for nightlife and music festival communities. At the second Vancouver SOUP, held on November 19th, 55 people donated $550 and voted The Binners’ Project the winner. The Binners’ Project creates jobs for people collecting redeemable containers and reduces waste being sent to landfills. At the event, Director Anna Godefroy explained that the money will go toward a new initiative called the Binners’ Box - where a dedicated box will be set up in laneways of buildings and housing complexes, allowing residents or businesses to place recyclable products with a deposit in the Binner Box, for a local binner to pick up. Keep an eye out for the testing phase of this project in the Downtown East Side soon! Vancouver SOUP is currently held in the Downtown East Side at Groundswell Café as a ‘city-wide SOUP’. The organizers see the SOUP appeal growing and aim to draw projects and ‘investors’ from all over the city as a larger crowd will raise more money for the winning project. At the same time, they recognize that each neighbourhood has its own character, and they are open to helping other neighbourhoods setup their own SOUP events. Thank you Vancouver, for showing us SOUP love! Nobel prize winning economist Joseph Stiglitz spoke at UBC last Friday and made the case that growing inequality in modern day America (and Canada) is a result of political choices we have made; the failed experiment of trickle down neo-conservative policies that have been advocated since the 70's. He boldly advanced the need for a new political agenda that will give ordinary people a bigger share of the pie. The presentation included graphs on income distribution, wealth distribution and other factors over the last 100 years, and the data clearly indicates the fact that the very rich have benefited handsomely since 1970, while others have barely held their own. He then provided comparisons between nation states to show that social equality was not so skewed elsewhere; in Scandinavia, western Europe, Japan and Canada the inequalities are modest compared to the USA. Approximately 20% aggregate 'income' in the USA goes to the top 1% of the population. He asserts that the rules of the game (video, Democracy Now), that is the legal and tax systems in the USA, the UK and New Zealand (and to some degree Canada), have been set to ensure the rich get richer. The analysis has been set out in two books by Siglitz over the last 6 years; The Price and Inequality and The Great Divide. He argues that it is time for ordinary people to challenge the privileges given to the very wealthy. He referred attendees to the Roosevelt Institute for additional insights and proposals. He eloquently argued that the erosion of the 'equality of opportunity' will lead to potentially immense social and economic costs. And he held up a copy of his just published book Rewriting the Rules of the American Economy. He closed his remarks with a pointed critique of the Trans Pacific Partnership ("TPP"), an international 'trade' agreement now being promoted in Canada and the USA. 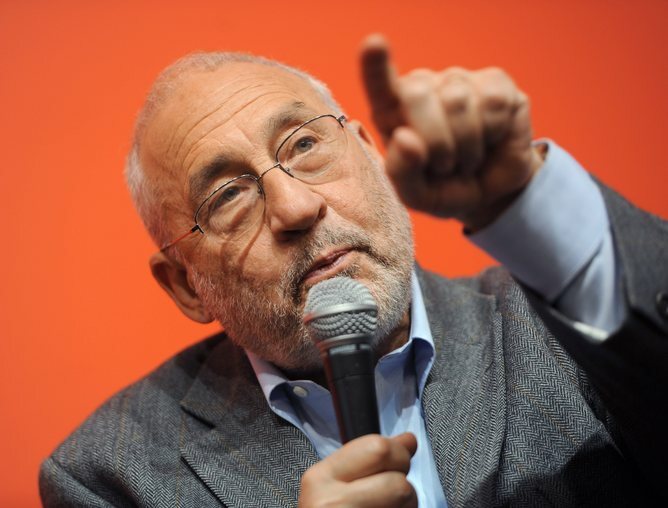 Stiglitz represented the deal as entrenching benefits for large corporations and international finance, and undermining democratic governments. He specifically noted that the TPP went well beyond 'trade' to impose limits on government regulation, government purchasing, and tax policies; and would have disputes settled by 'private' arbitration rather than in public courts. It can be noted that opponents to the TPP include the Council of Canadians, Open Media and Doctors Without Borders.